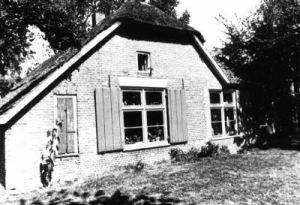 For a number of generations, the families of van de(r) Krol lived on the farms ‘De Groote Krol’ and ‘De Kleine Krol or Elleboog’ in Garderbroek, a hamlet near Kootwijkerbroek in the municipality of Barneveld. De Groote Krol, which is currently home to Krollerweg 9, and De Kleine Krol or Elleboog, now home to Garderbroekerweg 102, are located a few hundred meters apart. Genealogical research has shown that everyone with the name ‘van de Krol’ or ‘van der Krol’ is a descendent of the same ancestors of one of the two farms. Descendants of Frederik Dirksen all come from the farm de Groote Krol. Descendants of Aert Lubbertsen all come from the farm de Kleine Krol of Elleboog. People did not start using the name van de(r) Krol until 1811. Disclaimer: Due to privacy reasons, most persons since 1910 are protected; only their names are visible. However, they are known to me. All information is received from public archives that are freely accessible to all. With thanks to the Nederlandse Genealogische Vereniging and the Vereniging Veluwse Geslachten, as well as Jaap and Jacob van de Krol, Leny Aben-Nederpeld, Tijs van den Brink, Rudy de Jongh and the many emails from visitors of my website for all contributions. Sources: NGV, CBG, Genlias, WieWasWie, Geneanet, MyHeritage and Open-Archieven. I am writing a book (PDF) about everything from the origin of the name "van de (r) Krol". This will be published at the end of 2018. When you send me your email address I send it to you. Familytree with the names Krol, Mayer, Jansen en Horst. Familytree with the names Bakker, Stroom, Ruiter, Lohman, Pruim en Velzeboer.